Discontinuation is a horrifying word for many of us. More than once I caught myself feeling sad when I heard the news about perfumes being disconnected – sometimes even if those weren’t perfumes I loved or wore. Anyone who loves perfume tends to complain about the arbitrary way in which one scent after another can bite the dust, but we have to remember after all these are businesses, not revolving exhibitions. Either perfumers manage to stay current with public tastes and fashions or they don’t, and when they don’t, sales decline. Even though I agreed with her in principle, something bothered me – so I kept thinking. While discontinuation might be a necessary evil, a conspiracy theorist in me has a lot of doubts. Are those perfumes that get discontinued really worst sellers? Or, with everything else being equal, do companies put on the chopping block something that is more expensive to produce – be that due to costs of raw materials, bottle production, packaging or any other components that affect the bottom line? And isn’t it a negative reinforcement: companies train customers to like simpler perfumes that are cheap(er) to produce, put much more into promoting those – and as a result get lower sales for better perfumes and then discontinue them? Whatever the truth is, I don’t expect to learn it from any of LVMH or Estee Lauder‘s companies. And since the reasons would be different for those brands, for which economies of scale do not apply, there’s not much sense in asking them either. So I’ll have to keep wondering until somebody publishes an all-revealing memoir. When I recently heard of three of the perfumes I like being discontinued – Diptyque Volutes, Bvlgari Black and Tom Ford Fleur de Chine, – I realized that I wasn’t ready to buy a second bottle of any of them. Eau de Tommy Sooni II has disappeared with the brand, but even if I could find a bottle now, I’m not sure I would buy it. I might regret it one day but for now it feels like I have enough of them, taking into the account SABLE (Stash Above & Beyond Life Expectancy – Vanessa ©) state of my collection. I thought about it more and realized that Ormonde Jayne Ta’if is the only one, about which with a 100% certainty I can say that I’d buy a back-up bottle (or two) in a heartbeat at the first mentioning of the D-word. Look at your collection. Disregard decants, samples and “to buy” lists and concentrate only on full bottle of perfumes that are still in production. Now imagine that you learn that those all are being discontinued (not all at once: that would be too cruel even for a hypothetical question). Are there any perfumes for which you would buy a back-up bottle? I have a brown thumb. I know it is so because once I killed ivy – and it wasn’t even my intent! It doesn’t upset me too much since I never felt like growing anything. But despite that I’ve just adopted a plant. I wanted to do it for a while but for the last several years something would come up in January-February – the only two months when Daphne Odora (Winter Daphne) blooms. And knowing my “abilities” I wanted to get at least the first bloom. I found Daphne many years ago while walking in the park next to the office. I smelled something wonderful in the air – and just methodically sniffed every flower I could see around until I found it. Then it took me another year to figure out the name of that plant and then several more years to finally get it. Daphne’s flowers aren’t that impressive: pale pink with darker center. They resemble many others flowering shrubs’ blooms. But the scent is heavenly. 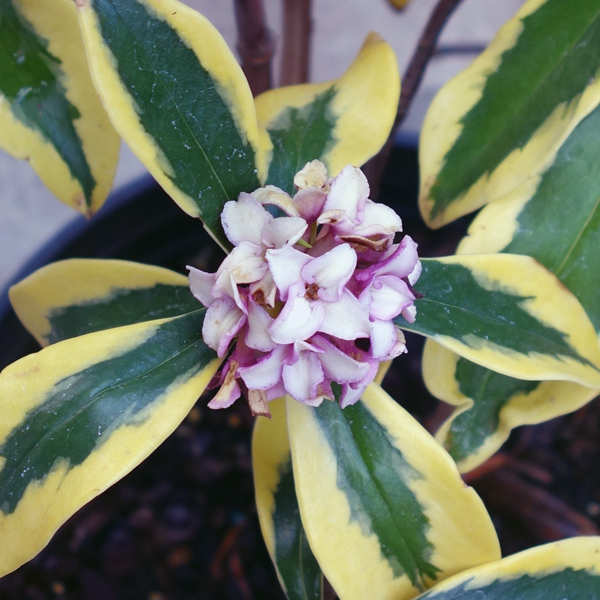 I thought how to describe Daphne’s aroma when serendipitously a couple of days ago I saw Ineke Ruhland’s Facebook post about that plant and I figured out that she was better qualified to give you an idea of how it smells – in case you haven’t smelled it before. I would say it’s a must-have plant for gardeners who like scented plants or for perfume lovers. I’ve heard many gardeners rave about the scent, which I would describe as orange flower + lemon + honey + molasses. It’s sweet but not cloying. […] When you run across one with loads of blooms, it’s a real wafter. Since I smelled Daphne for the first time I wanted to have perfume with that scent. “Daphne odora” was my standard answer to questions in different polls as to which note/scent you want created in a perfume form. 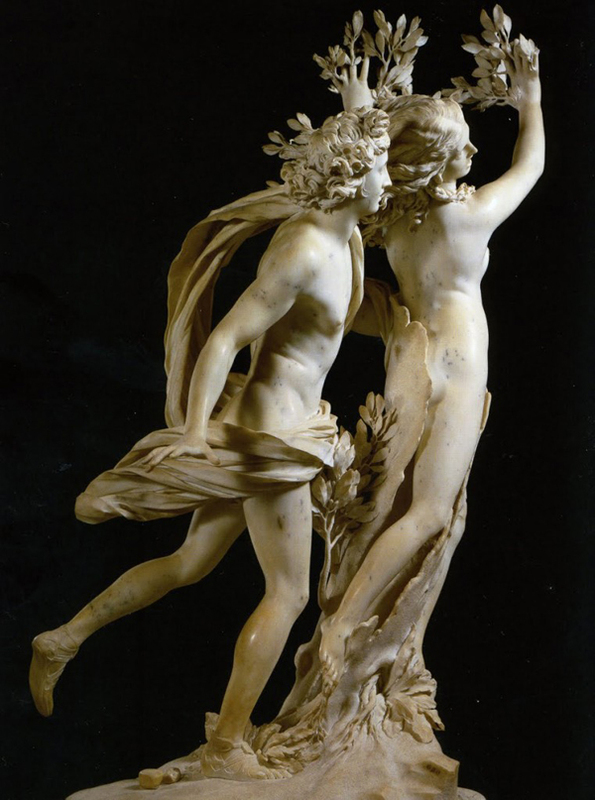 From what I read, all parts of Daphne plant are poisonous so I don’t think there will ever be an actual Daphne note in any perfume but I’m fine with a recreation – as long as it smells close. The first (and so far the only) perfume I ever saw listing Daphne as a note was Eau de Tommy Sooni II by Tommy Sooni (it’s not the most imaginative name, is it?). I read Victoria’s (EauMG) glowing review and it was an immediate lemming. You should read it too if you haven’t tried this perfume yet. I don’t think I can describe it better. Does it smell like Daphne? It doesn’t the way Carnal Flower smells of tuberose, Diorissimo of lily-of-the-valley or Miss Charming of roses. When I smell it on its own, my mind doesn’t conjure Daphne immediately. 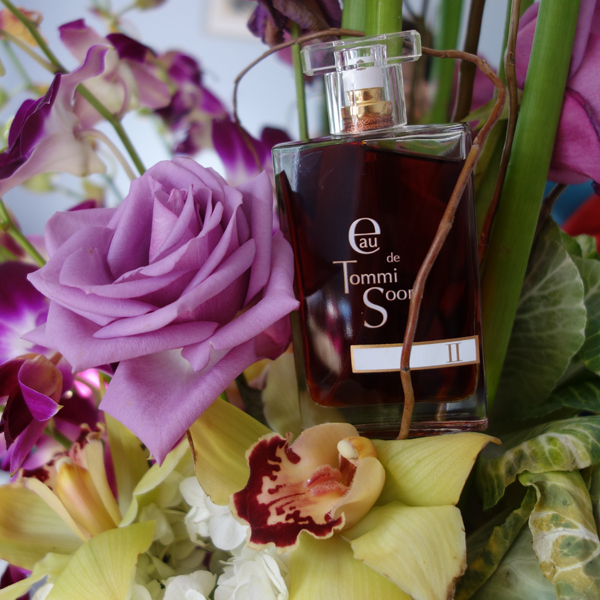 But when I do a side-by-side sniffing of the real flower and Eau de Tommi Sooni II, I can “see” the resemblance. It might be that this perfume has one of the many other types of Daphne, not Daphne odora that I like. I think that Eau de Tommi Sooni II is one of those perfumes praising which one does it a disservice: since this perfume doesn’t wow you from the first sniff telling you how wonderful it smells might create wrong expectations and cause a disappointment. But I can say that it is interesting: once I applied it I wanted to smell it again and again, it captivated me. When I finished the first sample I thought that I’d need a decant. By the time the second sample was half-gone I decided to get a bottle and see if I could make the plant last as long as 100 ml of the perfume. I hope that Daphne plant doesn’t run away from me in terror or turn into a nymph. So despite the not inspiring name and an objectionable bottle size (brands, be reasonable! Why make only 100 ml bottles??!) Eau de Tommi Sooni II has joined my collection as this year birthday perfume bottle.